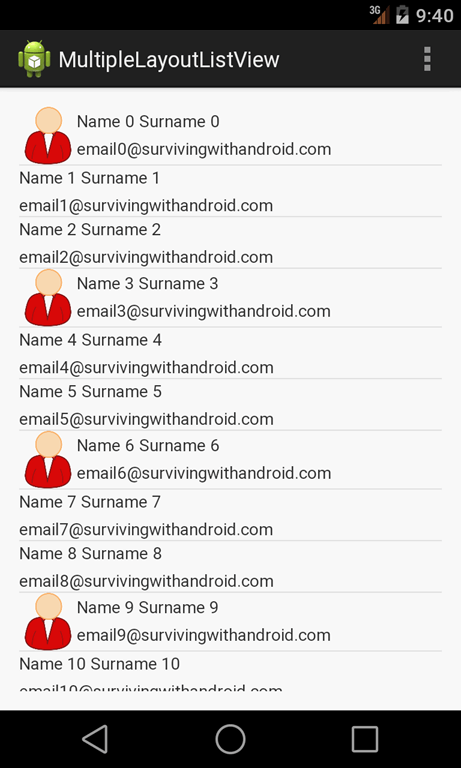 This Android Listview tutorial describes how to use Android ListView with multiple rows. Usually, we are used to a ListView with all rows having the same layout. This tutorial describes how to handle Android ListView with multiple row layout or in other words, rows that have different UI widget inside. You may already know how to create and handle an Android ListView, if not give a look at this post before reading this post. In this app, we show a Contact list that has two different layouts one that uses an image and another one without an image. Even if the example is quite simple, it is enough to understand how to use several ListView methods to get this result. Usually, when we want to customize the ListView data we use a custom adapter. We know Android provides some basic ready-to-use adapter (i.e ArrayAdapter, SimpleAdapter and so on) . We know, already, that all these adapters have in a common a father class known as BaseAdapter. When we want to customize how the ListView display the data, we can use one of the adapter class provided by Android or implement our custom adapter, in this case, we will create a custom adapter extending the BaseAdapter. The method getViewTypeCount “returns the number of types of Views that will be created by getView(int, View, ViewGroup)“. In other words, this method returns how many different layouts we have in our ListView. The getItemViewType returns the view type of the current row, if you look at the method signature we have the position as a parameter. One thing we should notice is that this method must return an integer value between 0 and the getViewTypeCount() – 1. So if we want to have multiple row layout, we have to override these methods and returns the right values. In this method, we use getContactType to know which layout to use, as you can see we return 0 or 1. 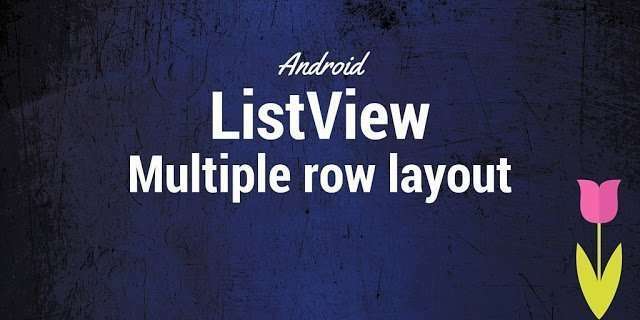 In this post, we created an Android app using ListView that holds different row layouts. hey how about int resource at constructor? when we had 2 layout? can you share full code the custom adapter? Each time is called findViewbyId() …. how to add more than 2 different layouts to list view? Appreciate for your tutorial, I create another Adapter extends SimpleCursorAdapter and only override getView and getItemViewType methods. It works fine now. Thank you again! By the way, I do think this way is better than using ViewBinder. A Francé, ma ‘sti codici? Are you not recycling views? What does this do when the lists are large? What if I want to set different layouts in position pairs, and other in position odd? I don’t get it, isn’t supposed to do this with an ArrayList?? Very simple and useful, thank you. pls send the source code for me? thank! this is a nice example but the code isn’t complete.